The photo was taken in the backyard of our 1920s bungalow, our home of 25 years, after seven weeks of trying to call attention to building code violations - and being repeatedly ignored and misled by City officials, especially Peter Wysocki, Director of our Planning Department. Besides being an invasion of privacy, we will soon discover that this building's setback was in violation, as is its size (still - March 2018), which was originally almost 100 square feet over maximum legal limit. It's slated to be a vacation rental property. The open balcony, aside from invading privacy, also provides no barrier to noise. It violates Colorado Springs Fire Access code and presents a danger to surrounding homes. Here are the major points of our story from April through the end of June, 2017. Unfortunately, we have to break this up into three parts as the dealings with our city government and our now former neighbors is extending beyond this time, and with no end in sight. 1. We learned our neighbors of a few years, a married couple, male and female, were going to build a "cottage with a loft" (their description) in the backyard; they said they planned to build it as a place for their relatives to stay when visiting, and to make it an Airbnb-type vacation rental property for times when it was vacant. They had bought the original home, a foreclosure property, with a special first-time homeowner's discount (several people we know looked into this property to buy and were told it was only available to a first-time homeowner by the realtor). The neighbors did an extensive renovation of that original property and the renovation went well. We were very grateful that they had improved that property and we told them so, as did other neighbors. We had no reason to be suspicious about an additional building (small cottages in the backyards of Westside homes are common additions), even though one of the two had bragged about being a "house flipper"). We were also not initially worried about it being a vacation rental. We have an Airbnb property ourselves, next door to the home where we live. We bought this property decades ago as a dilapidated HUD home and over the last twenty-five years we fixed it up and used it for our construction business. Last year we converted it to an Airbnb and found it to be a fun way to earn extra income. So, as soon as we heard about their building plans, we congratulated them on their new project. 4. I (Sandra) spoke to the female neighbor shortly after this and suggested mediation in lieu of a lawsuit. At that time, we said we would be satisfied if they built their balcony walls up to restore our privacy. We suggested a wall that incorporated glass blocks in the design for light; that way they could have their outdoor space, and we could have our privacy back. The neighbor countered with the idea of a wood wall. We agreed that his idea would be acceptable, thinking that it would allow us to have our privacy back. 5. The CONO organization (Council of Neighbors and Organizations) sent us a mediation letter to sign. 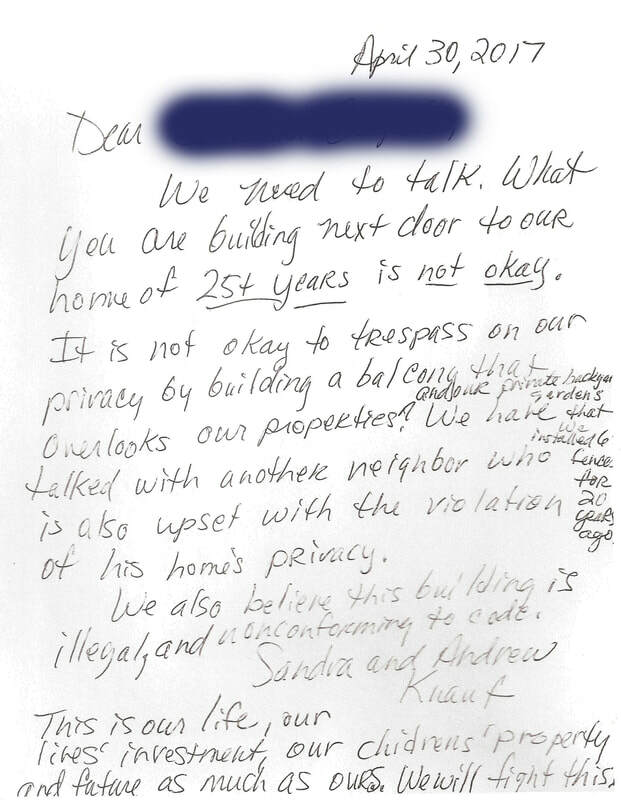 This letter, that, according to Sara Poe (now Vaas), the neighbors helped draft, stated that we would agree to a "wall of sorts". We could not sign something so vague, and so we investigated further. We then discovered that our neighbor had submitted a drawing to Regional Building Department to only amend this balcony with a pergola. The definition of a pergola: "a framework covered with trained climbing or trailing plants". 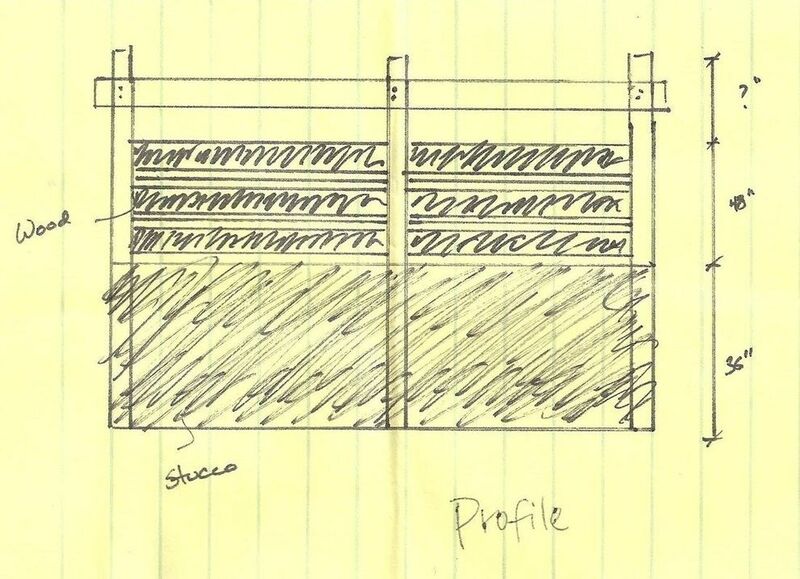 There was a note on the plan that the wall material, to be installed in this pergola framework, would be left up to the discretion of the homeowner. With no guarantee of a permanent wall (in fact, everything pointed to a wall that was temporary and easily dismantled), we felt we could not sign any agreement. We wrote back to CONO stating this, and we never heard back from them or the neighbors on the subject. 6. We sought legal advice. As we had no proof yet that Director Peter Wysocki was not telling the truth in regard to the setback and size of building, we asked about invasion of privacy. The lawyers we spoke to cautioned us about an invasion of privacy case. We might not win (much would depend on luck, on which judge got your case). It would be expensive. We were told that this would cost us around $20,000 out-of-pocket, which we cannot afford. 7. We continued to explore our options. We decided to check the building's setback ourselves, which was supposed to be 5' MINIMUM from our property line. We contacted a well-respected local surveying company (Alessi & Associates) and learned that it would cost over $3K to have our lot professionally surveyed and the findings filed. We were also coached on how to do it ourselves, as lots in this area are all 50' wide and the property lines here are fairly easy to determine with old buildings and fence lines (and everyone on our street has a fence). These lot lines have also been in existence for over a hundred years, so they are well-documented. Our city's Planning Dept. apparently did not look into the actual property line documentation (apparently they don't have to), and, instead, took the property lines from the drawing, which shows the line as existing at the outer wall of our c. 1923 garage. This was, and is, incorrect, and we do not understand how those who work with the city in this capacity would not have known something was amiss here when they originally measured the building and measured it again after the article! We've determined that the property line is actually at the eaves of our garage, one foot away from the garage wall (where a former chainlink fence existed for many years between our property and the property under construction). We pointed this out to the neighbors when they moved in and told them that this was the property line when they took down the chainlink fence. They ignored this information and built a new fence in front to align with our privacy fence that was erected a foot from the chainlink fence, a foot closer to our property, and attached to the side of our garage. We let this go as we did feel it was important enough, at the time, to get into a conflict about. They were now using this "property line" as the legitimate one. Again, it is not - they were told it was not. (Looking back, we should have seen this grab for property that was not theirs as a huge red flag.) Another note: They knew where the property lines were as they had the property surveyed, so this illegal setback has every indication of being done on purpose. To verify that we were correct about the property lines, we measured every single property on our street on both sides of our alley. We personally have old buildings and metal fence posts marking property lines on both of our properties, and so there was no doubt in measuring when we saw that they lined up with the fence lines directly across the alley. Our findings: The structure was built 4' away from our property, not 5'. This is a clear violation of the building code and our protests about this were ignored by Peter Wysocki (the head of the Colorado Springs Planning Department). NO ONE in the City up to this point helped us get answers on this. It is as if it is no one's job to do so! What we have learned is that there is no protection of established properties by our City. You can pay property taxes for decades, and you can live on a property and improve it, and that seems to mean little to our city officials. 8. As stated above, we were assured that the structure was correctly sized and violated no building codes - so was another neighbor, three doors down, who personally visited the Planning Department. Going on intuition that this structure was indeed oversized, as we saw nothing like this on any street on the Westside after living here for over three decades, we looked at the blueprints. We calculated the area measurements ourselves (and had a second and then a third person calculate the area to double- and triple-check our figures). We discovered that the property is oversized by almost 100 square feet! The maximum allowable size for an “A.D.U.” (Accessory Dwelling Unit) for this size lot is 750 square feet. (See Planning Director Peter Wysocki's quote in the Indy article.) This structure has a square footage of 835 square feet (the calculation does not including the balcony or first floor patio). Our City Planning Dept., in another instance of negligence, did not catch this. Part of the confusion on their part (although this does not excuse their negligence) could be because the figures on the heat calculation for the building’s permit are documented incorrectly. 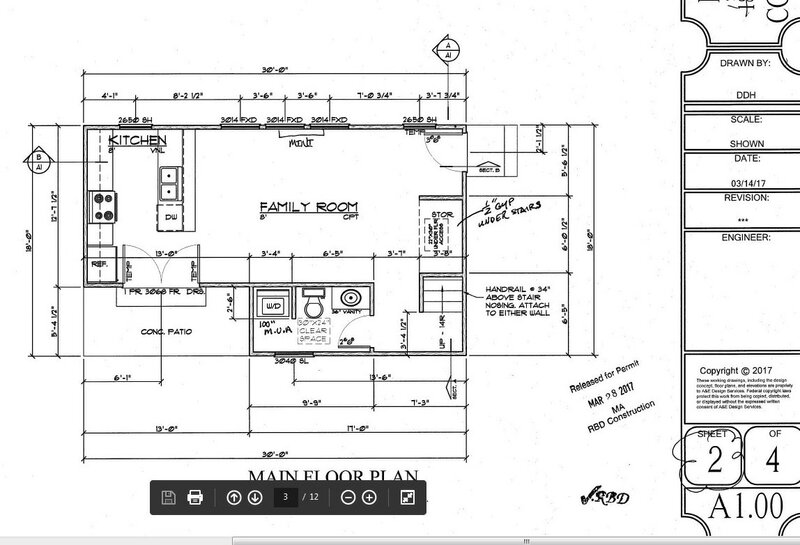 This document has the correct square footage for the upper level (365 sq. 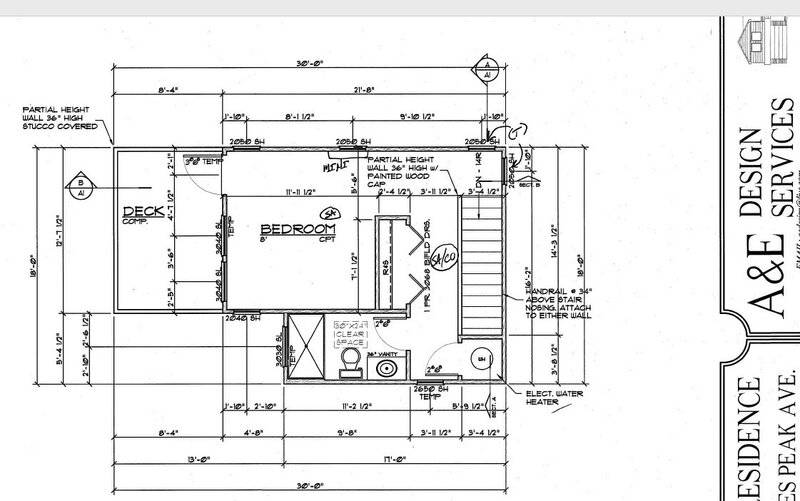 ft.), but states that the lower level is 379 square feet when it is actually 470 square feet. Using their figures on this sheet, the square footage for their building would be 744 square feet, just 6 square feet below the maximum square footage allowed by building code. (See documents below.) On paper it looks "legal". 9. We again wrote officials about these new findings, and, again, we were ignored by Peter Wysocki. We received a form-letter email from Sue Matz on our letter to Peter Wysocki, stating: "Thank you, we received your inquiry and will follow-up shortly." Then, again, no response. I had to call the next week, and then call again two days later, and send another email. Finally I got Peter Wysocki's voice message number. I left him two messages and he finally wrote back saying others had made the property line measurements and, again, that they were correct. Amazingly enough, he blatantly did not address the square footage issue! (See below, Letter of 6/22/2017) We wrote him again that the setback was wrong and asked why he did not address the square footage issue. Again, no response. We have spent many weeks so far doing the work that our city officials should be doing and writing letters to many City officials, only to be largely ignored and gaslighted (when you are told repeatedly that something is one way and it is not). We are again requesting an immediate Stop Order. After going over the house plans that ****** ****** submitted to your Planning Dept. for 1819 (misrepresented, actually 1817) W. Pikes Peak Ave., we have found that the building is over the 750 maximum square feet. You stated this was the maximum size in your reply to the article about this property in the Colorado Springs Independent on May 3, 2017: "Per City Code, ADUs must me [be] smaller in square footage than the primary house and are limited to 750 square feet." In addition, you were quoted, in this same article of May 3rd: "Both the side-yard setback (west) and the rear-yard setback (south) were measured at approximately 5', based on the apparent property lines." Five feet is incorrect. We have determined that the property line on the west has been misrepresented. This building has been erected with a 4' setback from our property line. The minimum is 5'. A variance and firewall would be required with a less than 5' setback. 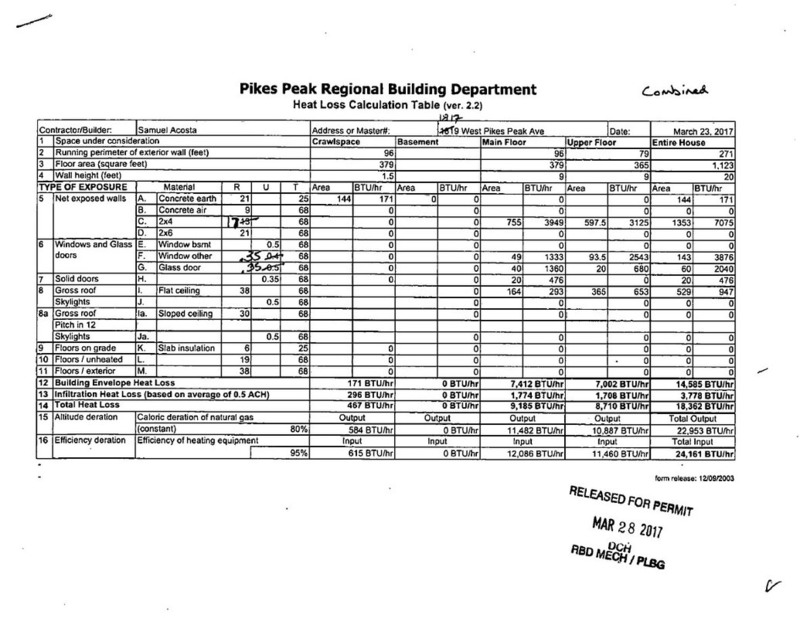 The figures on the heat calculation are wrong except for the upper level; this calculation is done from the plan presented to the building department and confirmed by a plan examiner who used the plan to verify the numbers and calculations. We and others would like to know how these mistakes were not found by the several departments invoked in this process (negligence or incompetence?). We feel that there have been laws broken here, and that this must be resolved by the city immediately. 1) Why was an incorrect maximum square feet allowed on this A.D.U.? 2) Why [were] incorrect property line measurements allowed? 3) Why doesn't Planning consider invasion of privacy on a property? This building was submitted with a side balcony that overlooks several 6' privacy fences. These kinds of mistakes mean a loss of property taxes for the City (under-reporting square footage). An incorrect setback leads to a violation of fire codes. Approving backyard buildings with privacy-invading balconies in a residential district mean (even though it is difficult to prove in a court of law) a lowering of property values. Again, we request an immediate Stop Order. To allow this building to be completed sets an illegal precedent. We demand, as taxpaying citizens, that the city has this structure torn down and that those responsible take responsibility for their mistakes. We have written you several times and tried in every way we can to discuss this problem. We are a country of laws and morals; we expect you to adhere to these laws and not be a party in negligence. Below is an admittedly emotional letter that I taped to our neighbor's door, after trying to communicate with them personally and getting no answer. Another person and I watched the neighbor read this note. He did not attempt to speak with with us afterwards, and we had to approach them again suggesting mediation (which later fell through, see #4 and #5 above). From the very beginning, we had a hunch that the building was illegally-sized and nonconforming to code. We told everyone this, including the neighbors, including building officials, including the media; in return, we were ignored and gaslighted by Planning Director Peter Wysocki. This is the "wall" that our neighbor submitted to Regional Building Department to restore our privacy, after their illegal structure (with a balcony that invades our privacy of 25 years) was built. We found out that what they actually submitted plans for was a "pergola" (literally - this is how it is described on the plans). A pergola is not a wall. A pergola is "a structure for vines." While boards were installed in the pergola, they are easily removable, lifting out from the grooved framework. The "wall" could be dismantled in minutes, which was clearly the intention. You replied on 6/22/2017 5:03 PM. The City relies on the applicant/builder to provide plans showing property lines, the location of the proposed structure and applicable setbacks. City staff reviews the plans to ensure that proper setbacks are indicated and meet City Code. Due to limited resources, the City does not normally field verify property lines nor setbacks; however, based on our process the plans submitted by the applicant show appropriate setbacks and it is our belief that the setbacks meet City standards. Upon your inquiry, the City’s Neighborhood Services staff measured the side-yard setbacks to verify compliance with the submitted plans. Although I understand your desire to protect your privacy, City Code does not prohibit two story accessory dwelling units or balconies/decks above the first floor. City Code also does not require privacy fences/walls between residences. There are countless examples throughout the City where one/two/three story homes overlook into the adjoining properties. Pursuant to City Code, the maximum allowable height of accessory dwelling units is 25 feet, regardless of the height of adjoining fences or residences. 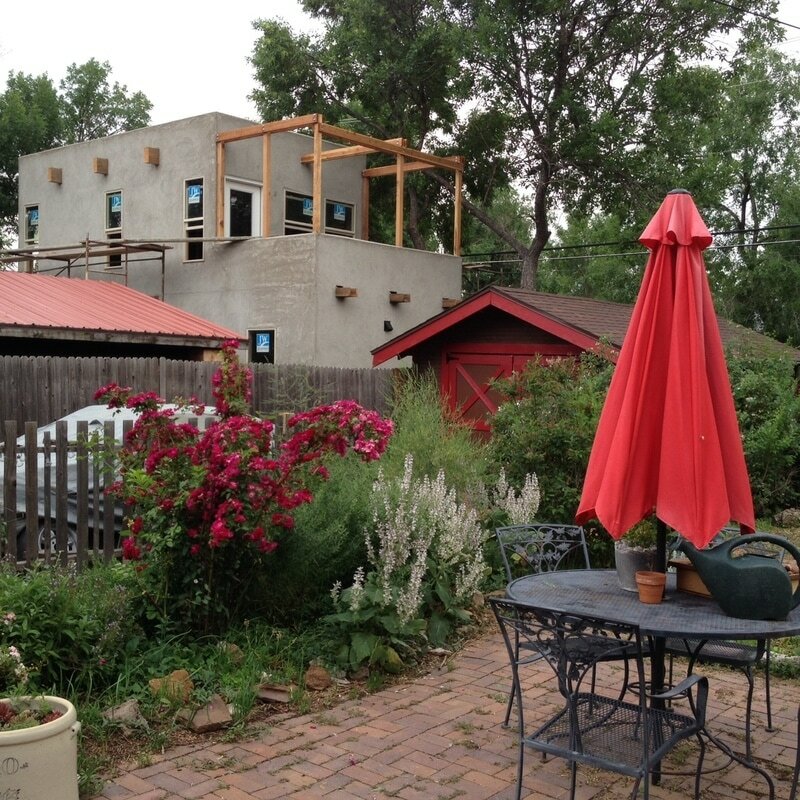 The City approved the plans for the accessory dwelling unit and a building permit was issued by the Regional Building Department. At this point, the City will not request the Regional Building Department to issue a stop work order as the construction of the unit complies with the approved plans. Thank you again for contacting us and I appreciate your interest in our community. On Monday, June 28th, you had a conversation with me (Andrew Knauf) about the A.D.U. at 1819 (mistakenly listed as 1817) W. Pikes Peak Ave. built by Sam Acosta. You admitted the property was in violation of City building code, being almost 100 square feet oversized. It seems highly unlikely that Sam Acosta, who has an engineering degree and built a large addition on this property only a few years ago, would make such a mistake accidentally. If he purposely made the building oversized, and then falsified the numbers to make the square footage total read 744 (a mere six feet below the 750 maximum), that constitutes fraud (“wrongful or criminal deception intended to result in financial or personal gain”). Rules matter. 750 square feet was determined by our city to be a fair maximum size for an A.D.U. on this size lot. The Acostas also built this structure with a large balcony (overlooking our private back yard of 25 years and a neighbor’s private yard) to get even more bang for their buck. Their greed is obvious, as is their disrespect for neighbors who would be impacted by this building, the historic character of this century-old neighborhood, and the Planning Department’s building codes. This structure is illegal and must be taken down. Illegal actions must have consequences. Every day that this structure stands is a reminder of the negligence and incompetence of the Planning Department. When you have a situation where a family has to calculate the square footage of an approved building plan themselves, after weeks of writing letters and making phone calls to the City about concerns that codes are being violated, and this family finds obvious mistakes that the employees at City Planning should have found, there is zero doubt—there is a huge problem with this branch of our city’s government. Now is the time to be on the side of the rules and of the people of Colorado Springs. We tried, in good faith and for over a month, to go through mediation with the Acostas. The time for mediation has passed. If you allow the Acostas to get away with brazenly violating the codes and creating a negative and illegal impact on our neighborhood, you are sending a message that it is acceptable to make a mockery out of our city and our neighborhoods. We’ve now been dealing with this for two full months. We hope that even though you have mishandled this complaint all along, you will do the right thing now and have this illegal building taken down immediately. To this letter, Wysocki responded (again, not addressing the issues - passing responsibility, this time on to Regional Building Dept., etc.). "Thank you for your comments. To my knowledge, Mr. Acosta has not requested a Certificate of Occupancy from the Regional Building Department. Until a Certificate of Occupancy is issued, the accessory dwelling unit cannot be occupied. Mr. Acosta has contacted city staff to discuss your concerns." We were especially saddened about "your" concerns - as if wrong numbers on plans and building illegally-sized structures is not one of their concerns! Amazingly enough, all of this could have been avoided and we would have been none the wiser, if that balcony wall was built up and our privacy returned to us immediately. But then, we wouldn't know how our local Planning Department operates and that the building is illegal. Now it is a different story altogether. 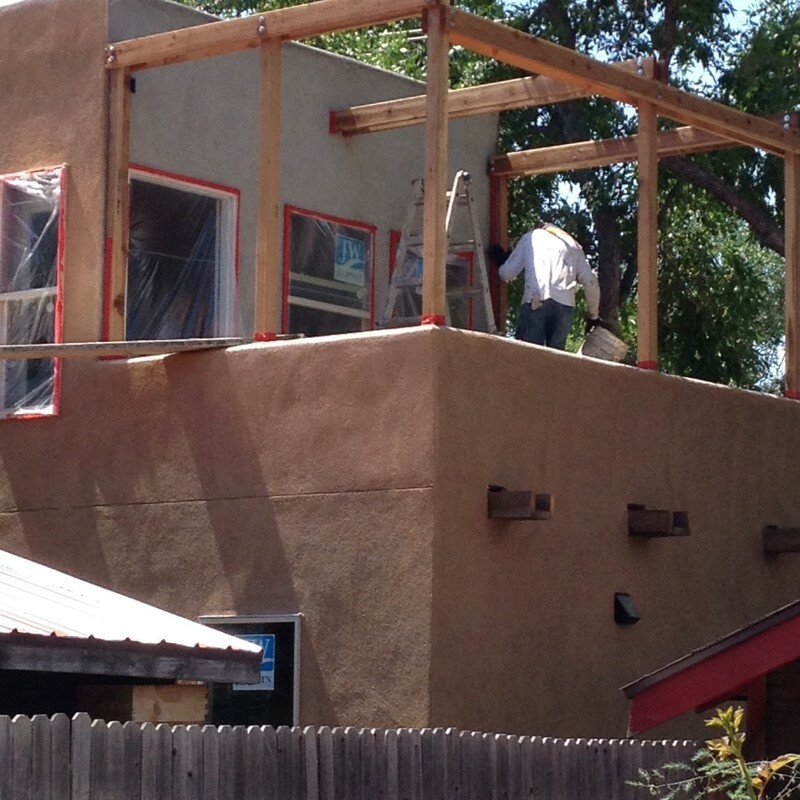 The photo below is when the final coat of stucco was put on the last week of June. This was taken looking up from my 20-year-old rose/perennial bed. With no fence there is no barrier to sound, and, again, this structure is slated to be an Airbnb-type property. It is offensive and violating in every way. It is out of place in this established historic district where the vast majority of homes are from the 1890s to the 1920s. It takes away from our heritage. It is out of scale to the property, much taller than the one-story home that is the main dwelling. It is out of scale to the other buildings on this block, towering over the historic two-story buildings. Everything about this building is wrong. It should have never been constructed and the issues are not only legal, but ethical. Perhaps then you could do us, and all neighborhoods in our city, a huge favor and give Mr. Wysocki's office a call, letting him know what you think about our story. (719) 385-5347. Or, better yet, send an email at this address: PWysocki@springsgov.com It'll just take a minute. This is what it's about. Showing that we care about our community, and that we expect our City officials do their jobs. Thank you. Unfortunately, this story continues in a "Part II" page, which will be published soon. As of this date, September 17, 2017, and regrettably, there has been no satisfactory resolution to this problem.